In the past, reviewing the Toyota Camry was rather easy. Journalists would say it was a solid and unkillable automobile; an unquestionably well-rounded, sensible sedan. Then they’d spread the word “boring” all over their article and call it a day. Truth is, for the longest time, Toyota’s midsize sedan was nothing more than precisely that: a car. Its buyers, which are plenty, cared not about driver involvement, styling or performance. All they wanted was a sedan that could effectively carry them, their passengers and their gear forever. Well now the Camry is no longer dull. That’s because Toyota’s big boss, Akio Toyoda, asked his employees to stop building boring vehicles. It seems to be working for Toyota’s sake. But is it working for the Camry? I drove one to find out. I spent the entire holiday season sliding around in this two-tone Blue Streak Metallic sedan, and “slide” really is the best way to describe the way it behaves in the snow, but I’ll get back to that later. What I want to talk about is the way the new Camry looks. It’s very loud, and busy. That in itself isn’t a problem, it’s refreshing. After all, we asked for this. But I’m not sure I find this car attractive. Here’s what I do like: the car is wide, low, properly stanced, and the entire styling is racy, like pulled back, as if it was combed by the wind itself. The rear is also pleasant to look at. It’s wide, with bulging fender flares and a quad exhaust treatment. Is this a Camry I’m describing? But then, there’s the excessive stuff which kind of ruin things. The front end has so many creases and folds, it appears as though several sections of other cars were glued together to assemble it. The cool-looking rear lateral vents, whose design extends into the taillights, are a nice touch, but they’re in fact fake. Finally, half of those quad exhaust tips don’t even seem functional. Taste is subjective, and what I think of the Camry’s design is irrelevant. What you should know is that this is a very polarizing car, inside and out. 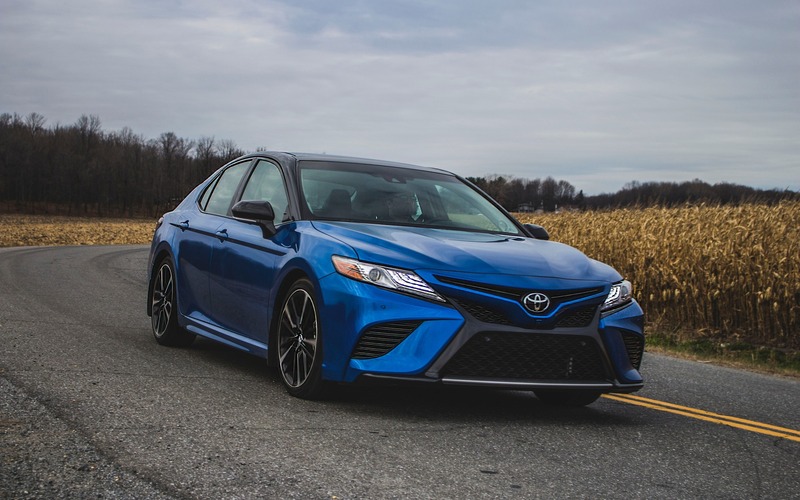 My tester was the sportiest trim available, the XSE V6, making the Camry one of the last midsize sedans currently available with a six-cylinder engine. At 3.5 litres of displacement, that engine is currently the bread-and-butter powertrain used across the Toyota/Lexus lineup. Now blessed with port and direct injection, power is rated at a stout 301 horsepower and 267 lb.-ft. of torque. The only available transmission is an eight-speed automatic. Front-wheel drive is the only way to go for all Camrys. A 2.5-litre four cylinder powers other versions, and there’s also a hybrid variant. I’m sure many of you are wondering if the Camry XSE is fast. It is, but then it isn’t. I mean, sure, Toyota claims a 0 to 100 km/h acceleration time of roughly six seconds. That’s quick, but also neck to neck with the four-cylinder turbo Honda Accord, which makes do with 50 less horsepower. Gun the accelerator pedal in Sport mode, and the automatic box responds almost instantly, almost free of the frustrating delays most of these modern systems are plagued with. But it’s not as reactive as what GM and Honda will sell you. It is a smart gearbox, though. In some cases, it’ll downshift a gear, then another, as if it was telling you “you need more power than this for what you seem to be doing,” and it’s all executed in Lexus-smooth effectiveness and creaminess. The engine loves to rev, sounds solid while doing so, but you never feel as though the car is actually fast. 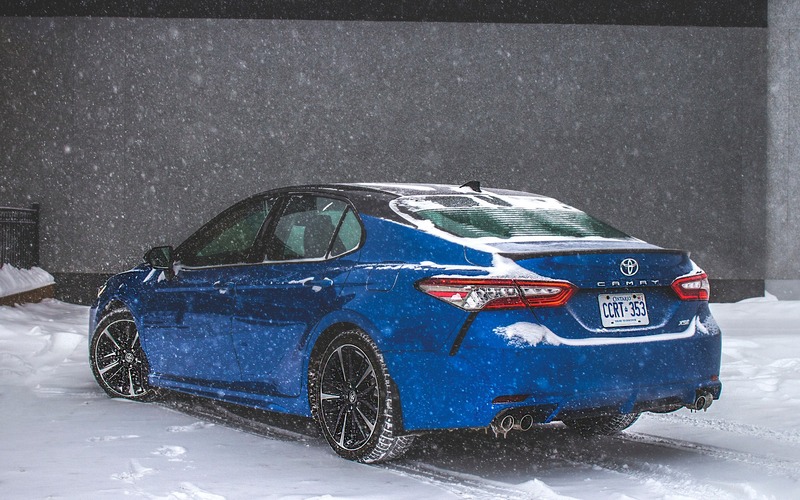 See the XSE as an overpowered Camry, and not a full-on performance version. Because there’s really only that—a big engine. Brakes and suspension components are identical to any other Camry V6. And it’s the same story with the car’s ride and handling. Quiet, smooth, sophisticated, refined. It’s all that. I’d be curious to compare this Camry to a current Lexus ES. I wouldn’t be surprised if the Toyota felt more Lexus-y. But handling isn’t all that dynamic; enter a corner quickly, and the first immediate feeling is of a heavy front end, caused by that large engine resting atop the front wheels. Understeer is excessive, and in the snow, you’d better know how to modulate your brakes and throttle, because this sucker plows forward like a BR Groomer. So the Camry looks racy, but rides like a cloud. That V6 pulls hard, but is outpaced by its main rival. The car can dance, but gets easily unsettled the moment you ask too much of it in a bend. Basically, it doesn’t know what it’s supposed to be. Inside, the confusion continues. Like the Camry’s exterior, its cabin is adorned with an eccentric, futuristic design. Kudos to Toyota for going all out on styling. Build quality is above average, so is the overall quality of the materials used. It’s quiet in there, spacious, especially out back where tall occupants will enjoy legroom for days, but due to an unpleasant bump in the centre of the seat, those same tall occupants might not appreciate their heads scraping the ceiling when sitting in the middle. 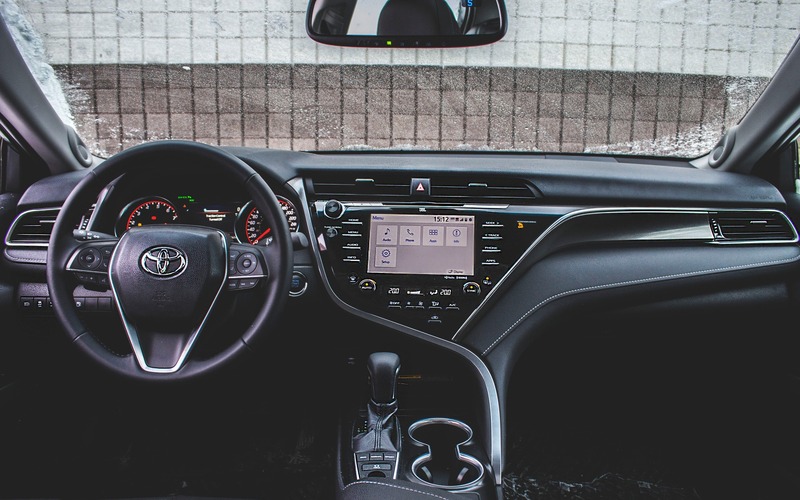 The 2018 Toyota Camry features Toyota’s latest Entune infotainment system, or as Toyota calls it: an App Suite. Again, it’s very polarizing. In an attempt to reduce glare, the interface has been changed to a black-on-white setup; it kind of works, until you realize you can’t adjust the screen’s actual brightness. It’s also a complicated system, cluttered with layers of menus, warning messages and functions that prevent it from being truly intuitive. Physical controls are a welcome touch when lowering the volume or changing radio stations with gloves on, but the system itself will only respond to the touch of your skin. Even the Home button is confusing. Pressing it doesn’t really bring you to a home screen. You’ll need to hit the Menu button to get there. The “who am I, where am I” theme continues with the available safety tech, which are controlled via another multi-layered and immensely confusing screen located within the gauge cluster. Tired of hearing the car beeping at you because you’re sitting too close to another car in traffic? Good luck finding the Off function for that. Sure, the Camry gets all the latest safety toys, but those same toys are annoyingly intrusive. When the car violently slams the brakes as you’re backing into your driveway by fear that you’ll hit a snowbank, you start wondering if these systems were in fact put here to protect us, or simply drive us crazy. Here’s how I’ll sum up my review of the 2018 Toyota Camry XSE V6: the Camry remains a solid purchase. It’s highly refined, quiet, smooth and redefines our expectations of such cars. It’s also bound to remain extremely reliable. But in an attempt to make the Camry an exciting car, the end product sadly comes through as a highly perplexed machine. Like a semi-retired rock-star that just downed a six-pack of Red Bull and attempts to jam alongside a dubstep DJ, the 2018 Toyota Camry XSE is puzzling, hard to comprehend, and a little weird. But boring it is not. 5/10	The best we observed was a 9.6 L/100 km average. Often, the car would hang around the 12 L/100 km mark, which is non-competitive for the segment. 7/10	The cabin is spacious, and the rear seat offers plenty of leg- and headroom, but the seats themselves are hard, and tall central rear passengers might find their head banging the ceiling. 8/10	The V6 pulls hard and strong, with linear torque delivery, and it all sounds great while doing so. Handling is flat and predictive, but understeer is excessive. 5/10	Complicated and dumb-witted. Layers of unnecessary widgets and redundant controls. Can't be operated with gloves, and its brightness can't be adjusted. 8/10	The Camry is always smooth and quiet, even when pushed hard, resembling a Lexus in terms of refinement. 8/10	Albeit a confusing infotainment system and intrusive safety tech, the 2018 Toyota Camry is smooth and quiet, finally looks exciting and redefines midsize sedan expectations. In Canada, the Toyota Avalon is a drop of water in the automotive ocean, but in the United States, it’s much more than that. That’s why Toyota is unsurprisingly continuing to fine-tune its full-size sedan. At the Detroit Auto Show , the Japanese brand has just unveiled its fifth-generation Avalon.